It’s the beginning of the year and like every year I think I need to change my book buying habits. At the end of last year, for the first time, I went over my book shop purchases and online orders of the last three years and counted every book. And while I was glad to find out that I had bought less in 2016 than in the previous years, I also had to find out that I bought at least three times as many books as I read and that of the books I read in 2016 only 50% had been bought that year. In the past, I often decided not to buy books for at least three months, participate in TBR dares and double dares and every time I broke the ban within a week, sometimes a day. It just felt like too much of a punishment and I simply couldn’t stick to it. One year, I decided to fix an amount. I decided that I wouldn’t buy for more than X$ every month. You’d be surprised how many books one can buy with even a small amount of money. Suddenly second-hand books became super interesting. So that didn’t work either. Then I decided not to buy more than two books a month. That too, didn’t work because by February I’d already bought the books for March and April too. It’s amazing how one can bend one’s rules. In the end, I had to admit that restrictive rules that only limited the amount of money spent and/or the amount of books I can buy don’t work for me. I need more than that. I need rules that make sense. So I went back to the piles and purchasing lists and analyzed these in more detail. That’s when I understood that the real problem was buying too much of the same thing. Of the above, the first annoys me the most. For one, hardbacks are more expensive. Then they are bigger and I have a hard time holding them, so will not be so keen to pick them up. And as soon as the year ends, they feel stale. Everybody has read and reviewed them and it takes awhile until you’re interested again. Buying too many of the same author is annoying as well. And silly. When I know I like an author, it’s fine but when I’ve never even read him/her . . . Chances that I don’t even like the writer are huge. The last category is to some extent linked to the first because I tend to buy huge piles of new crime/thriller and sci-fi/fantasy. But there are other genres/types of books that I don’t want to buy too many of. Last year I bought about at least twenty short story collections. Typically they take longer to read and I hardly ever read more than five or six. That makes fifteen for the piles. The same goes for essay collections. I try to read one per month but buy twenty a year. I could add other examples. Looking at my book buying habits in detail was sobering but I needed it. Clearly, I need new rules. I want to read more from my piles but I also wan t to stop buying another book published in 2017, as long as I’ve still got an unread book from this year. I don’t want to buy more than one genre novel at the same time and definitely not more than one book from the same author, unless I decide, like last year in the case of Richard Yates, that I’m going to dedicated a whole month to an author. Additionally, I don’t want to buy more than one book per week. Preferably, I’ll buy more books in book shops. Normally, I read 80% of the books that I buy in book shops, while I only read 30% that I order. There’s a good reason for that. Often I urgently want to read something but it takes almost two weeks to arrive, so by the time I get it, I’m reading something else. However, when I go to a book shop, I pick exactly what I want to read. Since I live in Switzerland, the choice of books in English isn’t big and they are a way more expensive than online (6$ for paperbacks and up to 15$ for hardbacks). One of the reasons why I buy so many books is that I quickly lose interest in my own piles. In the past, I found that themed reading helped me rekindle my interest in my piles. At the end of last year, when I felt like reading Japanese literature, I went over my piles and discovered so many books, that I got really enthusiastic. Mini-projects like this will help me stick to my piles. I’m not making an annual plan yet, but possibly, I’ll dedicate every month or at least a week per month to either the literature of a country, an author, or a genre. To cut a long story short – I want to cut my book buying but I’m doing it through “mindful” buying, not through any drastic bans or challenges. The latter don’t work in my case. I’ll let you know how it goes. Wish me luck. What New Year book buying resolutions do you have? We defintely have. 🙂 I’m not so bad with the cold turkey approach when it comes to other things but books . . .
It’s just too much fun to buy books. Sounds like you are approaching this with a lot of careful thought. Im still ruminating on my plan but it is going to involve going cold turkey for six months (by that I mean I am not going to buy anything new for that time though I can get as much as I want from the library). its going to be so hard but when I found books were falling off the shelves because they were crowded I knew something had to change…. Two of my book shelves have started to bend and I know it’s only a question of time when I need to either replace them or take A LOt of books off. Good luck with your cold turkey. I’m not saying I’ll never do it but the beginning of the years seems to be a particularly bad moment. I’ll be glad when I can stick to my rules and stick to 52 books a year. Good luck with your plan; it sounds very reasonable and thoughtful to me. I am trying to limit myself to 24 book purchases this year, since a complete ban doesn’t work. (Of course I already purchased my January allotment.) And I moved several of my stored books from boxes in the closet to boxes in the basement. I always get so enthusiastic about my own books when I rummage through a box and find something I completely forgot about. I figure that, in the basement, the boxes are more accessible, and when I feel the urge to shop, I will go down there and look through them to see if something strikes my fancy and then read that instead. Will it work? I sincerely hope so! Good luck, TJ. I know how it goes with the allotments. I saw the 24 book project on Stuck in a Book. Possibly you’re joining him. I was so tempted and also by the TBR dare but found myself ordering 6 books on New Year’s Eve. That’s when I knew it wouldn’t work. I have piles hidden behind doors and when I rediscover them I also get very enthusiastic. That’s why I came up with the themes. My unread books aren’t ordered, so there could be some of the same genre anywhere on piles. I really have to hunt for them. It’s a good idea to luck at the stacks instead of just buying books. Oh, a kindred spirit! I had planned not to buy any more books until I had read those in my TBR pile. Although not a New Year Resolution person, I had intended to keep to this plan. It was short lived! Already awaiting delivery of 3 more books. It’s a little like this with clothes although my will- power is a bit stronger. Tempted to buy now but will wait for Spring. It’s a case of the spirit being willing but the flesh is weak! Same here – I placed a big order at the end of the year because I wanted to seriously stick to my piles. Reducing would already be an achievement. And not pile up hardbacks. My will power with clothes is stronger too. I have an ongoing rule that goes to one of your experiences – if already I have a book by an author I’ve not read I don’t buy any more by that author. This one, like most of these things, came about because in a fit of enthusiasm I bought three novels by an author I thought I’d like and then discovered that their writing really didn’t work for me. Complete waste of money. You sent me down a bit of a journey to memory lane, because I posted about something similar back in 2012 and then blogged about how it had gone in 2013 (here’s the original post: https://pechorinsjournal.wordpress.com/2012/01/25/buying-less/ and the follow-up: https://pechorinsjournal.wordpress.com/2013/01/29/buying-less-an-audit/ in case of interest). 1. If I’ve not read anything by an author I don’t buy more than one book by that author as my first purchase. This avoids my Joseph Rathbone experience where I thought his work sounded great, bought three of his novels, read the first and hated it and so ended up giving them all away (two unread). 2. If I have an unread book by an author, I don’t buy another book by that author. This is sometimes tricky. I have an unread Echenoz, and keep reading reviews of other Echenoz novels which sound tremendous. It makes no sense though to buy them if I haven’t read the one I have. That kind of thinking led to my having everything Richard Yates has written (hardly a tragedy, but not really necessary given I read about one of his a year typically). It lead to my owning all Ian Rankin’s Rebus novels of which I’ve read the first five or so and then ground to a halt. Tastes change, and while at the time I bought them I was reading a Rankin a month it turns out that wasn’t a good predictor of how I’d carry on reading. 3. I can’t buy more books in a month than I’ve read or permanently removed from the house. This isn’t working well for me. Not because I haven’t stuck to it, I largely have. It’s not working because if I read four books and buy four books then I now have four more books on the shelves, and the same number of unread books as I started the month with. I may need to institute a firmer one in-one physically out policy or change the ratio (one in for each two read say). Rules 1 and 2 I do still pretty much stick with. They’ve worked well for me and I think they would for you too from what you say above. Rule three has slowly gone by the wayside as time has passed so I need to take a fresh look at that. I don’t think bans and challenges work for anyone much really. Your themed literature idea of inspiring yourself to look at stuff already in your pile is a good one – a noir month or Japanese month as you suggest could remind one that one already has three great noir novels or a really interesting couple of Japanese novels that were once themselves exciting new buys but that have since become part of the furniture. Kaggsy’s 1958 clubs and so on are good for this. Otherwise, some form of rationing I guess but that still allows some purchases rather than a crash diet. Still, a book a week (which isn’t that many) is still 52 books a year. For me that would be steady state, the same in as I read. If I reread anything I’d actually be increasing the TBR. It’s a tricky one. Thanks for adding your links. I remember you wrote about this a few years ago. I think rule 1 and 2 are feasible. The third possibly too. I read around 90 books per year and if I buy 52 that would really reduce the piles. I’m quite enthusiastic about the themed reading. I could do some very interesting weeks/months. One good thing comes of buying too much it seems. It gives you the opportunity to dive into a subject/genre. I’ve done the same with authors like you did with Rankin. Cathy is the only perosn I know who really sticks to her TBR pile. Oter than that? Some manage three months. I’m afraid that if I did I would then go into a frenzy. If you read 90 and buy only about 50 that seems pretty workable, and one a week is enough that if you have to defer a purchase you’re not deferring it that far (and more than one a week and you know you’re buying more than you’ll get through). I read around 50 a year, which is why it doesn’t work for me. The numbers have to be adjusted. In my case, probably from year to year. Sometimes I read more than 90 sometimes a bit less. I think one a week could really work. Thanks, Karen. I should do that as well when I see books – will I read this soon or not. Sometimes it’s nice to pick something just like that but not as often as I do. Or rather – not press the buy button on amazon so quickly anymore. Good luck to you as well. It’s an ongoing struggle for me that will probably never end. The only thing that much helps me is the rule I established for myself last year that for every new book that comes into the house, I have to find a new home for one that is already here. Now, I have about 1200 books on shelves and another 300 put away in closets, so you would think that would not be too hard to do. But guess again. It gets more and more difficult as time goes by to choose one to go out the door to its new residence. The rule isn’t perfect, but it’s slowed me down considerably when nothing else has ever done that. That’s not a bad suggestion at all. I have to think of including something like this. I also found a place where I could sell some of my second hand English books. An expat forum. I should just do it. I’m afraid, it will be an ongiong problem for me as well. Like you, and like most of the readers who’ve left comments, I struggle with this. It’s a recent phenomenon though, in my case. Before 2010/2011, I had hardly any books in the house which I hadn’t read (yes, there were still a lot of books, but many of them were old favourites, and I would try out new authors at the library instead of rushing to buy). However, when I moved to France and, ironically, had less acess to English language books, I started hoarding for a rainy day. I would make a trip to the UK or US and buy a large pile of books. I’d also hoard books in French for those days when I would no longer have easy access to them (plus, it was cheaper to order books from Germany there, and pay less for P&P). This coincided with a rising interest in writing, blogging, reviewing on my part as well, so I could not resist all the recommendations and suggestions I could see on other people’s blogs. It was easy to justify to myself: after all, books are small purchases, so much less expensive than nearly anything else (even a lipstick, which they keep saying is a mood booster in times of economic depression). It sounds like we’ve done a similar thing. I’m hoarding for the sme reasons. When I’m in France I buy huge piles of Frecnh books, in the UK the same and order them because they so much cheaper. It was always bad but when I started blogging it got worse and worse. One book isn’t all that expensive but if you take them all together, it cans still be a small fortune. In Switzerland some books are just as expensive as a luxiry lipstick. I wish you good luck with your reading from the piles project. Yes, I hardly ever bought books in Switzerland, they were so expensive! It’s one if my excuses for ordering so much but it’s not a good excuse. I have no plans but some day soon my partner will walk into the room I work in and will start a sentence like this ‘Can I just say …’ I will reply ‘Oh no please don’t …’ And then shortly afterwards books will start being packed up for the charity shops nearby. Good luck with your own plans! Thansk, Victoria. I get comments like that very often. Sometimes in an exasperated tone, sometimes amused. Most people find it very eccentric. On New Years Eve they played a game of “who finds the most hidden piles”. It was goodnatured teasing but nonetheless, I had to tell myself – this needs to stop. Now. I’m attempting a total lock-down this year due to my utter lack of self-control over the past few years. I’m a sucker for secondhand books and lose hours and fortunes in charity shops – all good important reads that I’m determined to start as soon as I finish the book I’m currently reading, but I end up buying far more than I can possibly read. I’m hoping that my book-buying fast will help get my addiction under control, as well as getting me to focus on the treasures I’ve already got stored up rather than constantly pining after those I haven’t. I really hope you’ll manage. I know how you feel. It is an addiction and gets out if hands so easily. Having a lot if books is one thing but piles and piles if unread ones is different. I’ve managed shirt reduction periods and always enjoyed going through the piles. I’m glad you liked the mindful approach. I hope it will work for. As you say, it’s also a lot if time that gets lost looking for books. I had to laugh at this post. I am SO familiar with this. I get swept away in shops by the covers, the feel of the book, the way the page edges might be cut, the blurb on the back. You would think we are all smoking, drinking, gambling addicts but if you say you’re addicted to buying books people just roll their eyes (especially if they aren’t bookish). I think of rules for buying them but the impulse is just too strong. I walk into the independent book shop with all the glorious new things, sniff the air like an ancient beagle and dive right in like the book sloth I am. I literally crawl over them like a slug. Good luck and thanks for the entertainment. I will look forward to seeing how you go. All the best for 2017. I’m so gald this made you laugh. It has slapstick elements. It feels a lot like any other addiction or that’s how I imagine it as I don’t drink, gamble, smoke . . . What baffles people isn’t that I buy a lot of books but that I buy way more than I can read and that many piles are piles of unread books. I’m gald we don’t have any good second hand book shops here which sell English books or I wouldn’t be able to do it. Or great independent book shops. They have closed down. I’ll let you know how it goes. I have to confess – I already bought two books this week. Haha. That sounds like eminently sensible thinking and planning, and I wish you luck. I’m trying to do something similar using the TBR dare, less trips into town, and more looking at my own books to remind me of how many good things I have already. Thanks, Jane. I hope I can stick to it and wish you luck with your TBR dare. I have no idea why I always forget that I already own so many lovely books. Better ones sometimes than those I buy new and read right away. I find that new books are easier to avoid buying as it’s possible to buy them at a later date, so there’s no rush, unless you’re intending to read it straight away that is. But it’s cheap second-hand books that are my weakness. I find using the library and a kindle help me keep my buying (of physical books) down a hell of a lot though. When faced with the option of buying or not I ask myself how easy is it to get the book in a rush should I want/need to and if it’s readily available I often find myself putting it back on the shelf. I agree with you and if I was living in an English speaking country, I’m sure it would be a little better. I just don’t like waiting for a book when I’m really in the mood to read them and so I order many I know I might want to read, even though they are new and because of the prices here. I just don’t get it why I should pay 16£ for a book that would cost me 6£ on amazon. 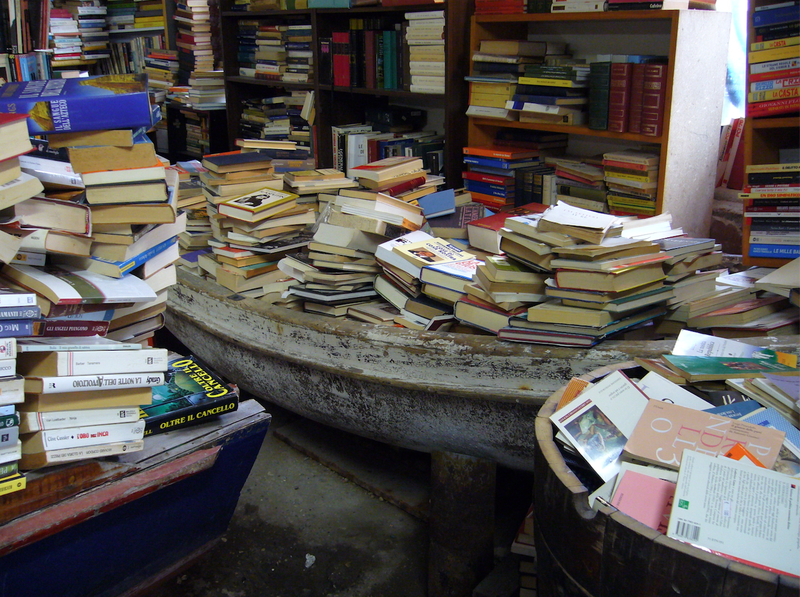 I’m sure that if I visit a second hand book shop in the UK and see Viragos or something similar – I’ll crumble. Do you use GoodReads or similar? I find having a virtual TBR useful in that I can just pile on anything I vaguely want to read without having to buy the physical book. It’s not quite the same I know but it can help. No, I don’t use it. I can’t tell you why but I just don’t like Goodreads. I started once but gave up quickly. I tend to buy too many books by the same author too. I’m limiting my book buying to one a week. One a week is what I’m aiming for but , to be honest, if it’s two a week it’s too much but still so m uch better than what I did last year and the years before. I joined a goodreads group and we each pick levels to wade through the TBR list. It’s working so far as the list is promoted more in my mind than acquiring new books. That’s a good idea too. I’m not so keen on Goodreads though. I have an account but didn’t not use it. I’m trying to cut down on book purchases too, especially for the first half of this year in the hope of making a bit of a dent in the piles at home. If I see a book that interests me, I try to add it to my wishlist rather than buying it on the spot – then I can review the list at a later date and decide which books I really want to buy. Well, that’s the plan (I’ve been doing it on and off for while now). It works well for new books, but less so for secondhand/harder-to-find items as the temptation to buy on the spot is so much greater. Good luck with your plans – I’ll be interested to hear how it goes. Thanks, Jacqui. I’ll keep you all posted. I tried the wish list approach but it didn’t work. Or keeping a book in the virtual basket for a week before ordering . . . I never made notes of the books I bought, but I’m doing it now. So this is new and will possibly help as well. I really hope it will work for you. I’m glad we don’t have tempting second hand book shops. Thank you. It will be tough. This is a great post Caroline. I was where you were a few years ago. From my earlier book buying days, I have books in my house that I purchased ten even twenty years ago that I have never gotten around to reading. I now only acquire book shortly before I will read it. The one exception to this is if I find something in a used book store or sale that is difficult to find. Good luck with your plans. In the end, it really only matters that you enjoy what you read. That is a great picture that you posted. I took the picture in Venice. I hope I can do the same you do. Buy books shortly before I read them. That will be an achievement. Good to hear that you used to do the same but could stop doing it. I’m hopeful. I also want to start selling the books I know I will not read again. Giving away those I’ll never read would be a next step but I’m not ready for that yet. Good luck! I have done my preorders for 2017 and am hoping that will be it, it is not many books so far, but we will see how that goes! Thanks, Kailana. I have never even preordered a book. But maybe when you wait for a sequel or a book by a specific order that’s the way to do it. I’ve been staying in and getting through purchases with the stoves on and a pint of ale to wash the pages down. I’ve got more books than I’ll realistically finish in the next 5 years. I try to think of how great probably will be as I assess new purchases. Rationing and layoffs only make what is rationed and laid off all the more precious. It sounds like you’re having a great time. I’m afraid I might not even get through my piles in ten years. But as you say, rationing makes me crave more. Maybe I should try to read quicker. The sad thing is I know I gave gems on my piles and I’m missing out. I think being mindful is the easiest way, I always end up bringing or losing the desire to read when I restrict myself. I don’t think I’m brave enough to look at either my book spend or my new books to books read ratio. It took me years to look into the numbers but it was so sobering that it should be helpful. I feel like that too. Not allowing myself to buy almost affects my reading enthusiasm. I have the same problem. Like Max, I don’t buy a book by an author if I already have one by them at home. I’ll try to read from the pile in 2017 too. Thanks Emma. Good luck to you as well in that case. Great post! Thank you. I can readily sympathize with you and I wish you good luck with your project!. I have collected “vintage” books (pre-1950) for years and I have a huge collection of them. I’ve read most of them and love the way they look on the shelf. However, I recently decided to get rid of most of them to make room for new purchases. That’s when I found out that old books are virtually worthless. Stores that sell used books will only pay pennies for them. Posting them on sites like eBay gets virtually no nibbles and by the time you calculate in postage, each sale is a net loss. So there’s one thing worse than buying too many books … and that’s finding out that you can’t get rid of them to make room for new ones. I have that problem too and that’s why I cling to so many of my books. Or books I inherited. Nobody wants them and selling them actually costs in the end. I might do a fela market thing or something similar. I have many new books I won’t rereda and those will be bought but the others? Not so much. I might put the pre 1950 books in a box. You never know, sometimes people look for them, especially when they are still in good condition and buy the whole lot. Ha! I could have written this post! 🙂 I’ve tried all the things to curtail my book buying, but nothing works. Nothing! I don’t do well with any sort of rules, but in desperation I decided at the end of 2016 to set myself a monthly amount to spend on books in 2017. I ended up spending three times that amount on New Years Day. I have pretty good impulse control these days when it comes to everything else in my life, but not when it comes to buying books. I tend to get obsessed with a particular author or topic and indulge in buying binges, but by the time the books arrive I’ve moved on to someone/something else. I calculated how much money I spent on unread books last year, and got rather a nasty surprise. Multiply that by the number of years my book buying has been out of control, and it’s grim. I’ve been trying to write a post about it, but I seem to always be announcing a new ‘Read My Own Books’ plan, and nothing ever sticks. Thanks, Violet. I wish you luck as well. At the end of the year I decided something similar and then ordered six books on New Year’s Eve. That’s when I decided I need some kind of rule. My impulse control’s pertty good to normally but not when it comes to books. And I tend to do exactly the same as you do – order many books of one author/theme genre and by the time they arrive, I’ve moved on. I didn’t calculate how much I sepnt on books last year but in a previous year and it was a shock. That’s why I cut down last year but it was still too much. One thing I still can’t do is getting rid of books I haven’t read. I know many book bloggers manage to cull but I don’t. If I had someone who wanted the books I’d be able to let go but no such luck. I am a book addict. I have a problem. However, it’s a problem I am not looking to fix any time soon. My happy place is the bookstore! I do wish you luck though! Thank you. I used to think like that for the longest time but now it’s just too much. Bookstores will still be happy places though. Oh, I can certainly sympathize, Caroline! I’ve tried to create similar parameters around my book buying habits. It’s so hard! Do you ever donate or sell your old books? I try to do that once or twice a year to make room on my shelves. I see that we are both reading Our Souls at Night. 🙂 Also, I’m a fan of Pema Chodron, but I’ve not read the one on your list. I don’t donate much at all. It’s a bit differet here. We don’t have places like Oxfam, which I know from the UK and where you can find great books. In charity shops here, they will just end up neglected. I’m a careful reader and my books all look as good as new. I’ll try to sell them. I’m reading Our Souls At Night because of your recommendation. I love it. Pema Chodron is amazing. I can recommend this one.It has 108 short chapters. Meditation guidance and other guidance. I think I am in the minority of book bloggers in that I don’t buy a lot of books – but I have a good reason – I work in a public library! So I tend to buy maybe 10-15 books a year, max. That said, I seem to prioritize the library books over the books I buy, so I still end up with quite a few unread books at home at the end of the year. I am going to try to mix it up this year between library books and my own books, maybe even alternate those as I go. I think your strategies of looking closer at the categories and not buying as many of the same type are excellent ways to help control the “problem.” (A good problem to have – too many books!) Best of luck! You’re lucky. I live in a German speaking country and read mostly English books which I wouldn’t find at a public library. It’s one reason/excuse to buy a lot if books. I could imagine that having them at hand in a library would also make me start many, so I see why you have piles too. I also have a tendency of starting several books in the same category and The it takes ages to finish them. Well, you know I have this problem too. Reading on a Kindle has helped tremendously because I no longer have groaning bookshelves. I donated a LOT of books each time I moved, and realized I didn’t need all my favorites in hardback. My TBR pile stands at around 500, so it will take me years to read them all. I also like to read current literature, which doesn’t help. One thing I’ve changed, though: I read many reviews from readers I trust and don’t just jump at a new book because it’s getting a lot of buzz. I wish I could use the library more, but every time I look up a book it’s either checked out or has a long waiting list. Have also found that I feel pressured to read a library book quickly and that takes away the enjoyment a little. Sorry you don’t like Goodreads. I’ve gotten some very good recommendations there and now they have a program where they send an email announcing that a book on your to-read shelf is available for just $1.99. I don’t feel guilty spending that little at all! You know what I’ve been doing – ordering books for the kindle and then buy the physical book anyway. It’s very rare that I enjoy reading a novel on the kindle. I would save money and space. Non-fiction is different but I have the bad habit of starting too many. I’m afraid my TBr might be even bigger than yours. I’m actually ashamed just to think of it. Like you, reading reviews has helped me to hold back on some new publications but on the other hand I read some book blogs who continously tempt me. They also rarely read/review newer books but lots of English women writers from the beginning of the 20th century. Those are dangerous blogs. Terrific thoughts. I have been struggling with this in preparation for my 2017 reading. My situation seems to be very different from yours. I live in a small town in the US and we have an excellent library system. As a retired librarian the library is my go to spot, rather than the bookstore. I still have stacks of books from Amazon purchases. Those normally happen when I am reading a review, especially at night, and discover that I cannot obtain said book from the library. It is so easy to click the Amazon button and see the book show up two days later. Certainly I must wait longer if I buy the book from Amazon’s Marketplace. It can be up to about a two week wait, but always feels like I have found a treasure. So the piles of books grow. I will say that I do love receiving books as gifts. My friends and family know that I have read a lot, and am rather particular about what I will pick up. As a result I usually receive some gems that I hadn’t heard of before. This year I have decided that when I want to buy a book I will add it to my “want to read” list from “Goodreads.” Then I can wait, and look at the piles on my shelves and floor to give me some perspective. Other than audiobooks, my plan is to read books that I purchased in the last few years first. I have made special piles of those that I will read first (hopefully). I wiould be so i teresting to review this next January to see if we have made any headway with our new objectives and goals. Your situation is very different, indeed. I can order English books at the local book shop and when I’m lucky I will get the book in two days but it will cost me 6$ – 16$ more which is a lot. That’s why I do this mostly with German books. Those aren’t as expensive. But when I order from amazon or Book Depository it takes way longer than Marketplace. Interesting, right? I’m adding books to my amazon wish list but it doesn’t keep me from buying. I’m pretty certain that my new “rules” will help. Of course, it’s only the second week but I’ve already managed to say “no” to a couple of books because I’d just gotten something in the same genre. I also feel like I want to tackle my TBR backwards and certainly not chronologically. We have to keep each other posted. I’ll be doing a mid-year post. Latest, I think. Since I only read about a book a week on average, Caroline, I’m tickled that you and Guy are comfortable with trying to limit yourselves to one book purchase a week this year. I can handle that! A new book every week! If I ever come up with a successful strategy of my own, I’ll come back here and share my newfound “wisdom” with you. My TBR, much like yours, keeps growing each year. Meh. Meh indeed. Obviously, considering the piles we all gave one per week us too much but at least I wouldn’t buy more than I read. I hope you’ll share your strategy if you find a new and hopefully successful approach. I’ve done short book-buying-bans in the past and they were nearly all a waste of time – as soon as the month was over I would stock up on what I wanted. Last year I had a book-buying-ban that essentially lasted the year (with some built-in wiggle-room by allowing myself to buy the books on the Stella Prize shortlist if I hadn’t already read them, as well as 12 ARCs). It was extremely successful and I think it’s because it went for a year – after awhile, I simply tuned out the ‘new-release’ noise and just focused on what I had. I’m doing the same again this year. That’s very interesting. I’ve never even thought of completely stopping to buy books, I only ever tried for some weeks or months. And to reduce the numbers. Possibly, the cold turkey for a longer period would work. Congratulations to you and good luck for this year. I’m still sticking to my plans, so I’m ok.